Whatever your project, we have the specialized engineers to make it work. Client projects. Engineered for better results. INTECSEA is a world leader in deepwater and specialized engineering. Our clients rely on us for our inherent safety, through world-class design, engineered reliability and technical integrity. In addition, our solutions-driven approach for full lifecycle asset management means we can take care of every specialized engineering project, no matter how complex, from initial concept through to final decommissioning. 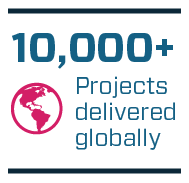 We combine a comprehensive range of specialized skills and engineering disciplines, our truly integrated teams provide system solutions to projects of all sizes – from a relatively simple tie-back or pipeline to world-scale deepwater developments in the toughest environments – anywhere in the world. Our most valuable asset is our people and their knowledge, and our most valuable skill is the professional and creative way we work with clients to develop smart solutions. With a proven track record for meeting the technological demands of ultra-deepwater, Arctic and difficult fluid conditions such as HPHT and high corrosivity, INTECSEA's engineers have been helping clients to set industry benchmarks over many years. See what we can do for you.